In case you weren’t aware, caterpillars can be fantastically beautiful. Take, for example, this little guy, which happens to look a bit like an alien. 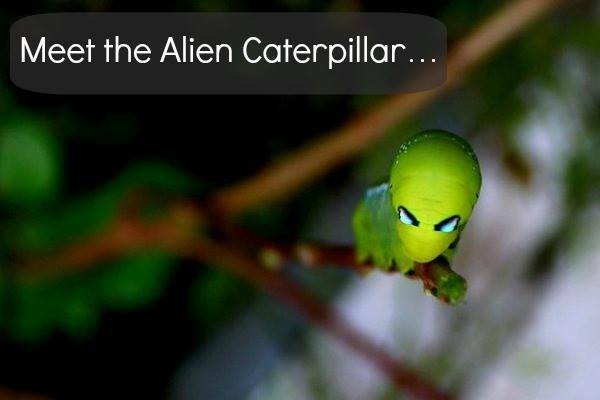 Unfortunately, this particular species isn’t actually called “the alien caterpillar” (personally, I am in favor of a name change). Pictured here is “Daphnis nerii” or the Oleander Hawk-moth, and these guys are amazing for a number of reasons. First, they look like something out of a science fiction book. When they are first born, they are a pale blue color. 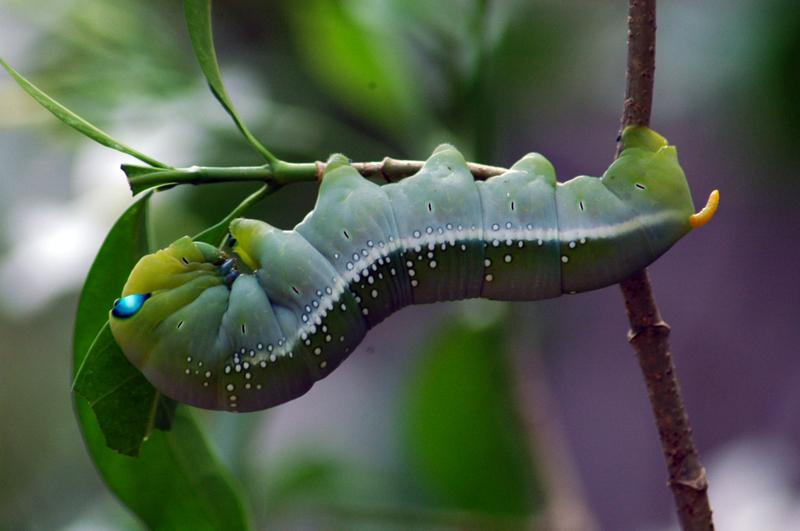 This slowly changes to green as the larvae age and become adults. The eerie blue eyes and the strange black brows make them look like Martians, but although they may be cool to look at, they are’t terribly helpful when it comes to seeing. Actually, they aren’t at all helpful when it comes to seeing, because they aren’t eyes. They are actually spots. Second, they eat toxins. When in the caterpillar stage, Daphnis nerii feed primarily on nerium oleander leaves. The leaves of this plant are toxic to humans and a number of other animals; however, you’d have to consume quite a bit in order for there to be any serious risk. In 2002, the Toxic Exposure Surveillance System reported that there were over 840 instances of exposure to oleander in the United States. Yet, fatalities are exceedingly rare. From 1985 to 2005 there were only 3 confirmed deaths (these were generally linked to individuals using an extract from the plant for various purposes). Of course, the caterpillars are immune to the toxicity of these leaves, so they are only eating something that is toxic to other creatures (honestly, what sense would it make if your primary source of food poisoned you?). They also have a cool horn on their backside. In the above image, you can see the final stage of the horn. Initially, the horn has a long, black cap on it. This pointed portion eventually falls off. After losing its bulbous cap, the horn becomes orange with a black tip, looking rather like a tiny tail.